On March 29, 2018, the Judge Ricardo S. Martinez of the United States District Court for the Western District of Washington entered an order granting a motion for summary judgment in Mendez Rojas v. Johnson, 305 F.Supp.3d 1176 (W.D. Wash. Mar. 29, 2018) [PDF version]. Judge Martinez concluded that the Government had failed to provide certain aliens who it had certified as class members with adequate notice of the one-year filing deadline for asylum applications, and thereby had violated the Immigration and Nationality Act (INA), the Administrative Procedures Act (APA), governing regulations, and due process. As a result, Judge Martinez ordered the Government to begin allowing asylum applications from class members, notwithstanding the one year deadline, within 90 days of the order. The Government has appealed from the decision to the United States Court of Appeals for the Ninth Circuit, and the Order remains stayed. However, on August 2, 2018, the government and the plaintiffs entered into a joint stay agreement, wherein during the pendency of the stay, the government will treat as timely filed asylum applications filed by class members who do not have final orders of removal [see section for current rules]. In this article, we will examine the Order in the instant case and the content of the joint stay agreement. We will update the site with further information as it becomes available. Please note that this article is up to date as of August 13, 2018. Plaintiffs in the case were individuals seeking asylum who had alleged that the government had not provided them with adequate notice of the one-year filing deadline for asylum. For the foregoing reasons, Judge Martinez ruled in favor of the plaintiffs and entered an order to remedy the injury that they suffered. We will examine the case background in this section, working our way to the order and its consequences. Who were not notified by the DHS of the one-year deadline for filing an asylum application under section 208(a)(2)(B). I. All individuals described above who are not in removal proceedings and who either (a) have not yet applied for asylum or (b) applied for asylum after one year of their last arrival. II. All individuals described above who are in removal proceedings and who have either (a) not yet applied for asylum or (b) applied for asylum after one year of their last arrival. I. All individuals described above in Class B who are not in removal proceedings and who either (a) have not yet applied for asylum or (b) have applied for asylum after one year of their last arrival. II. All individuals described above who are in removal proceedings and who either (a) have not yet applied for asylum or (b) have applied for asylum after one year of their last arrival. Class A and B are distinguished primarily based on whether the alien received a credible fear determination. Class A encompasses aliens who were detained upon entry and found to have established a credible fear of persecution. Class B encompasses aliens who were or will be detained upon entry and who were or will be released from DHS custody and issued an NTA without a credible fear determination. Both classes are subdivided between those members who are not in removal proceedings and those members who are in removal proceedings. It is important to note that aliens who are not described in either Class A or B are not affected by the order. The order does not apply not to all asylum seekers or prospective asylum seekers, but applies only to those who fall within either Class A or Class B. You may also see the certified classes on page 2 of the March 29 order [PDF version]. After granting class certification, Judge Martinez then considered whether to grant the plaintiffs' motion for summary judgment. The plaintiffs sought summary judgment based on the allegation that the government had illegally failed to provide class members with adequate notification of the one-year filing deadline for asylum petitions. The claimed in turn that the government's failure (1) violated the APA and INA; and (2) violated the Due Process Clause of the 5th Amendment to the U.S. Constitution. Judge Martinez ruled in favor of the plaintiffs on both counts. Section 208(a)(1) provides that any alien who is physically present in the United States or who arrives in the United States may apply for asylum, “irrespective of such alien's status…” However, the statute also provides certain limitations on applying for asylum. At issue in the instant case, section 208(b)(1)(A) states that an alien may not apply for asylum unless he or she “demonstrates by clear and convincing evidence that the application has been filed within 1 year after the date of the alien's arrival in the United States.” There is a limited exception to the asylum time bar if the alien establishes either that there exist changed circumstances which materially affect his or her eligibility for asylum or that there exist extraordinary circumstances which directly related to his or her delay in filing the application before the one-year filing deadline. The plaintiffs argued that the government is required to provide notice of the one-year deadline in a timely manner in order to comport with the intent of Congress underlying the aforementioned asylum statutes. The government did not deny that it does not provide blanket notice to all asylum seekers at the time of apprehension, during the credible fear determination process, or upon release. However, the government argued that it was not required to provide blanket notice under the plain language of the INA. Judge Martinez explained that he found the Congressional record to be pertinent to the issue at hand, and noted that Senator Hatch's concern was that the time bar did not pretermit legitimate asylum claims. Furthermore, Senator Hatch made clear that he would be watching how the one-year filing limit was implemented to ensure that it was being implemented fairly. For these reasons, Judge Martinez agreed that failure to provide notice of the one-year time bar for asylum violated congressional intent. Next, Judge Martinez addressed the argument of the plaintiffs that the government's failure to provide adequate notice violated the Due Process Clause of the Fifth Amendment. Judge Martinez described the plaintiffs' claim as asserting that the government routinely does “not provide notice that is reasonably calculated to timely convey information about the [one-year] deadline, and that the failure to provide notice violates procedural due process rights.” The government stated that it does provide notice, and took the position that the plaintiffs applied an incorrect standard for the procedural due process claim. The “Know Your Rights” video shown to DHS detainees. The government also noted that the United States Court of Appeals for the Ninth Circuit, in whose jurisdiction the instant case arose, has held that publicly available documents can suffice for providing notice. Judge Martinez explained, however, that the government failed to respond to the argument made by the plaintiffs to the effect that courts have held that public notice is not always significant. For example, he cited to the Ninth Circuit decision in Martinez-De Bojorquez v. Ashcroft, 365 F.3d 800 (9th Cir. 2004) [PDF version]. Applying Mullane, Judge Martinez held that “reasonably calculated” notice requirement in the context of applying for asylum requires that “the notice must be reasonably calculated to apprise Class A members of this right upon a credible fear determination, and Class B members when they express a fear of returning to their country, but are released or will be released without a credible fear determination and are instead issued a Notice to Appear.” Judge Martinez assumed that, due to the length of immigration adjudications, in cases where class members are not made aware of the asylum time bar, they will necessarily not file their asylum applications on time. Therefore, he concluded that the notice provided by the government was not “reasonably calculated” as he determined was required for members of Class A and Class B under the Mullane standard. Judge Martinez concluded that the one-year time limit provision itself is not reasonably calculated to provide class members with sufficient notice of the asylum time bar. Thus, he concluded that further notice would be required. However, he found that the notices currently provided by the government were also not reasonably calculated to notify applicants of the asylum time bar. Specifically, he found the persuasive the reasoning of the United States Court of Appeals for the Eleventh Circuit in Grayden v. Rhodes, 345 F.3d 1225, 1242-43 (11th Cir. 2003) [PDF version], a case that dealt with whether tenants had adequate notice of certain available remedies under the city code, in concluding that the government had not provided class members with sufficient notice under the time bar. Judge Martinez also cited to Walters v. Reno, 145 F.3d 1032, 1043 (9th Cir. 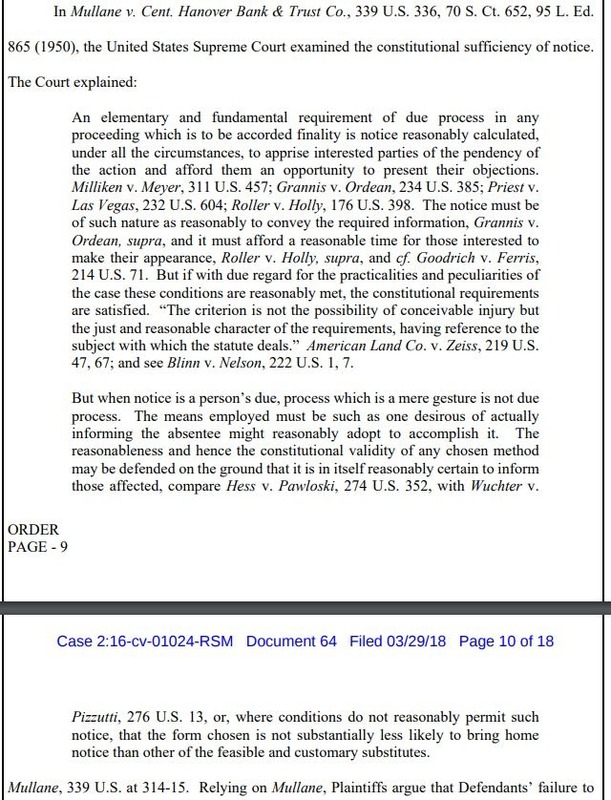 1998) [PDF version], wherein the Ninth Circuit held that a form that lacks relevant information “lulls the [noncitizen] into a false sense of procedural security.” He also found persuasive the decision of the United States Court of Appeals for the Third Circuit in United States v. Charleswell, 456 F.3d 347, 356-57 (3d Cir. 2006) [PDF version], wherein the Court wrote that “it is simply unrealistic to expect [a noncitizen] to recognize, understand and pursue his statutory right” to judicial review absent notice, in a different immigration issue. For these reasons, Judge Martinez concluded that the DHS's notice to class members was insufficient under the applicable standard set forth in Mullane. The plaintiffs argued that the Government's failure to provide a uniform notification mechanism of the one-year asylum filing limit violated section 208 of the INA, the APA, and due process under the Fifth Amendment. The Court rejected arguments by the Government that (1) the Court lacked jurisdiction; (2) the data relied upon the plaintiffs were outdated; and (3) the Government's procedures were entitled to administrative deference. Because Judge Martinez concluded that the government's procedures “left class members without an adequate mechanism to timely file their asylum applications,” he afforded relief under the APA. Judge Martinez declined to address the plaintiffs' argument about due process further having already concluded that relief was warranted under statute. Significantly, Judge Martinez ordered the DHS “to accept as timely filed any asylum application from a class member that is filed within one year of the date of adoption of this notice…” We examine the current state of affairs for class members in the next section. Judge Martinez also ordered the Government to, within 120 days of the order, adopt and publicize uniform procedural mechanisms that will ensure that all class members are able to timely file their asylum applications. We address this notice in this article [see section]. On May 25, 2018, the government appealed the decision to the Ninth Circuit. The Order of Judge Martinez was and is remained stayed. On August 2, 2018, the plaintiffs and the government entered into a joint stay agreement in effect while the government's appeal of the Order is pending before the Ninth Circuit (see AILA Doc. No. 16070100 (Aug. 6, 2018)). Under the stay agreement, the government agreed to find that all asylum applications filed by class members in pending adjudications before an immigration judge, the Board of Immigration Appeals, and the United States Citizenship and Immigration Services (USCIS) during the stay were timely filed. The term “pending adjudication” excludes cases where a final administrative order of removal has been issued, including cases that are filed during the stay. However, it does not include cases that still require a motion to reopen. In short, the government will treat as timely filed asylum applications filed by class members during the stay who do not have final orders of removal. The DHS agreed to use a broad reading of class definitions during the stay. Class members must notify adjudicators that they are class members during the pendency of the stay. If the putative class member does not have representation, the adjudicator must provide him or her with notice of potential class membership. A credible affidavit may suffice for establishing class membership absent contrary evidence. The Executive Office for Immigration Review agreed to post notice of the Mendez-Rojas decision in every immigration court and the USCIS agreed to post notice in all asylum office waiting rooms or lobby. The DHS and EOIR have posted notice the joint stay agreement in Mendez Rojas in asylum offices and immigration courts nationwide. You may see the notice here [PDF version]. Furthermore, class counsel has produced and put online a useful PDF outlining the current situation that we have discussed in this article. You may see the PDF here [see link]. The Mendez Rojas proceedings are significant in two respects. First, if the Order is affirmed on appeal by the Ninth Circuit, it will provide relief to a large number of aliens who did not receive adequate notice of the one-year asylum filing deadline by allowing them to file for asylum within one year of the Order taking effect. Second, it promises to apply prospectively, requiring the government to provide more robust notice of the asylum time bar rule going forward. In the interim, it is important for qualifying class members to be aware of their rights to have their asylum applications accepted during the stay agreement period. In general, individuals in proceedings should seek the counsel of an experienced immigration attorney, who will be able to assess their case and ensure that their rights and interests are protected. However, it is worth noting that the government has agreed to special provisions to apprise un-represented class members of their rights under the stay agreement as well. To learn more about asylum and refugee protection, please see our full section on the subject on site [see category]. We will update the site with more information about these significant proceedings as it becomes available.